1m wide polypropylene rake and handle, especially suited to raking soil and bunkers. This larger rake has 3cm gaps between teeth. 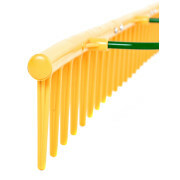 The 24P is a replica of the original wooden Hay Rake; is lighter in weight, very strong and flexible, and can be used on soil, gravel, grass and leaves. Please note; To ensure safe transport of this rake, minimal assembly is required. For further information regarding the 24P Large Polypropylene Soil/Bunker Rake, please contact our technical sales team on 01952 641949.